With their jewel-like appearance, pomegranate seeds make a beautiful topping for this simple, Eastern Mediterranean-style pizza. Preheat the oven to 220ºC, gas mark 7. Place the aubergine slices on a large baking sheet and drizzle 3 tablespoons olive oil over. Cover with foil and bake for 20 minutes, or until soft. Remove from the oven and cool. Meanwhile, combine the bread mix with 300ml hand-hot water and 3tsp oil, or as per packet instructions. Knead until smooth and elastic. Oil a 28cm x 38cm baking sheet, then roll out the dough on a lightly floured surface to the same dimensions. Place the dough on the sheet and fold and pinch the edges to make a rim. Brush the base of the dough with more of the oil, then spread with the houmous. Dust with paprika, then scatter the red onion over and top with the aubergine, arranged attractively in overlapping slices. Brush the remaining olive oil liberally over the aubergine slices, then sprinkle with the oregano. Bake for 20 minutes. 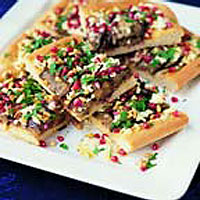 Remove the pizza from the oven and scatter with the pine nuts, pomegranate seeds and crumbled feta. Return to the oven for 10 minutes, or until the dough and topping are thoroughly cooked. Allow to cool slightly before sprinkling the parsley over. Cut into wedges and, if you like, serve with a yogurt sauce, flavoured with a little chopped chilli and fresh mint. Make in advance up to Step 4 before freezing. Thaw, then continue with Step 5. Replace the aubergine with Grilled Peppers in Olive Oil or Grilled Artichokes in Olive Oil from the Waitrose Cooks' Ingredients range.